The third quarter of 2016 was another positive one US mobile operators. AT&T, T-Mobile, Verizon and Sprint all gained both total customers and postpaid customers last quarter. But only T-Mobile and Sprint gained high-margin postpaid phone customers. T-Mobile added 969,000 postpaid, 684,000 prepaid, and 317,000 wholesale customers for a total gain of 1.97 million customers. That compares with gains of 1.88 million in Q2 2016 and 2.31 million a year ago in Q3 2015. AT&T added 212,000 postpaid, 304,000 prepaid, and 1.3 million connected device subscribers, but lost 315,000 reseller customers for a total gain of 1.53 million subscribers vs gains of 1.36 million in Q2 2016 and 2.51 million in Q3 2015. Sprint added 344,000 postpaid and 823,000 wholesale customers but lost 427,000 prepaid users for a total gain of 740,000 customers vs gains of 377,000 in Q2 2016 and 1.06 million in Q3 2015. Verizon added 442,000 postpaid connections and 83,000 prepaid customers for a total gain of 525,000 vs gains of 585,000 in Q2 2016 and 1.21 million in Q3 2015. Verizon, AT&T and T-Mobile were profitable last quarter. Sprint posted its ninth quarterly loss in a row. Verizon made a profit of $3.75 billion last quarter compared with $831 million in Q2 2016 and 4.17 billion a year ago in Q3 2015. AT&T made $3.32 billion last quarter compared with $3.41 billion in Q2 2016 and $2.99 billion in Q3 2015. T-Mobile made $368 million last quarter compared with $228 million in Q2 2016 and $128 million in Q3 2015. Sprint lost $142 million compared with losses of $302 million in Q2 2016 and $585 million in Q3 2015. *Estimated. Verizon doesn't report wholesale and M2M customer numbers. Verizon reported 113.7 million retail connections at the end of Q3, 2016. I estimate that Verizon has approximately 142.5 million total subscribers, including MVNO, wholesale and M2M connections. TracFone's revenue was up 6.4% quarter over quarter and 9.7% year over year. TracFone operates the Straight Talk, NET10, Tracfone, Simple Mobile, Page Plus, Total Wireless, Telcel America, Walmart Family Mobile, GoSmart and SafeLink Wireless MVNO brands in the US. Postpaid phone customers are generally much more profitable than tablet, connected device, prepaid and wholesale customers. Industry watchers put a lot of emphasis on postpaid phone customer gains and loses. Only T-Mobile and Sprint gained postpaid phone subscribers this last quarter. The number of branded prepaid customers increased by 144 thousand, the ninth quarterly increase in a row. The gains came from T-Mobile, AT&T and Verizon, as Sprint lost prepaid customers. Tracking prepaid growth number this quarter is complicated by T-Mobile's sale of Walmart Family Mobile and GoSmart to TracFone during the period. T-Mobile reported that it gained 684,000 prepaid subscribers in the quarter but its branded prepaid customer count only grew by 358,000 quarter over quarter. That's because 326,000 GoSmart prepaid customers were sold to TracFone. The Walmart Family Mobile customers are postpaid so they do not affect T-Mobile's prepaid numbers. TracFone added 1.2 million subscribers last quarter but all that growth comes TracFone's acquisition of Walmart Family Mobile and GoSmart. TracFone added 1.2 million subscribers due to its acquisition of 1.7 million Walmart Family Mobile and GoSmart subscribers. Without the acquisition, TracFone would have lost about 500,000 customers. In summary, it was another great quarter for T-Mobile, which once again lead the industry in all four customer addition metrics: total customer adds, total postpaid adds, total postpaid phone adds and total prepaid additions. Verizon was the most profitable operator last quarter but it's growth seems to be slowing as it gained fewer new customers than AT&T, T-Mobile and even Sprint. AT&T and Verizon both lost lucrative postpaid phone subscribers. TracFone grew by acquisition but would have lost customers otherwise. Sprint gained customers, including high value postpaid phone subscribers, but lost money and prepaid customers. It looks like Sprint is about to lose lots more prepaid customers. Wave7 Research's Jeff Moore discovered something interesting in Sprint's Q3 investor conference call. In the call (see page 2 of this transcript - free subscription required), CEO Marcelo Claure signaled that Sprint expects to lose a whopping 2 million prepaid customers next quarter as a result of Sprint "...materially tightening the customer engagement criteria..." Claure said that "because we're only eliminating customers with no or low engagement, we do not expect a material impact to our prepaid revenue." I think that means that the 2 million prepaid customers that Sprint is shedding are ones who have been cut off for non-payment but have been kept on the books in the hope they will come back someday. How does Sprint cut off prepaid customers for non-payment since they pre-pay their service? IOW, Sprint has 2 million prepaid customers on the books who decided to not continue with Sprint? Sprint therefore inflates their prepaid numbers by not taking them off the books after say 30 days. Is that common in the industry? If you don't pay, your service gets cut off when your paid up service days end. Most carrier prepaid plans have a grace period of at least 90 days after your service gets suspended for non-payment before the account is cancelled and the phone number recycled. But Sprint had to have been counting suspended lines as subscribers for much longer than 90 days to accumulate 2 million of them. For Sprint, does that mean they are losing prepaid customers in Sprint prepaid, or does that include Boost and Virgin as well? I love Boost..hope their prepaid never goes under. I'll stick with Boost until the end. Also hoping new promotions will be coming. On financial reports; Boost, Virgin, Sprint Prepaid and Assurance customers are all included in the prepaid category. Sprint did not break down the numbers by prepaid brand. "But only T-Mobile and Sprint gained high-margin postpaid phone customers." The postpaid count includes postpaid tablet, mobile broadband, connected cars and other IOT devices as well as postpaid phones. AT&T and Verizon's gains in postpaid non-phone devices offset their postpaid phone losses. IOT connections for things like shipment tracking, smart meters and industrial process monitoring are growing rapidly. now that Walmart family mobile is on Trac fone has it become prepaid or is it still post paid and Trac fone sends those customers bills? Walmart Family Mobile is still postpaid. They send bills as text messages. The amount of customer gains is insignificant compared to the total numbers of customers. And customers quarter after quarter are overwhelmingly choosing AT&T and Verizon, and of course their various divisions. "customers quarter after quarter are overwhelmingly choosing AT&T and Verizon"
Well, it depends on what you're looking at. T-Mobile is purely a mobile communications company, whereas AT&T and Verizon have wireline and ISP businesses as well, among others. So to make fair comparisons, you have to compare at the levels everyone plays at. And that level--cellular customers--AT&T Wireless and Verizon Wireless are slowly losing customers. It seems that Verizon and AT&T have forsaken many of their fixed wireless customers. These internet customers no longer have the option to get service from them and are looking to wireless to meet their needs. While many of the forsaken are using Cricket service, others are utilizing T-Mobile and Sprint and this will continue to be an engine of growth for the second tier providers as more and more customers are left behind in the ISP game. AT&T and Verizon are not slowly losing cellular customers, they are slowly gaining them. Last quarter both lost postpaid phone customers but gained in total cellular customers. According to the carriers, the postpaid phones customers who are leaving are mostly feature phone users who are moving to prepaid. 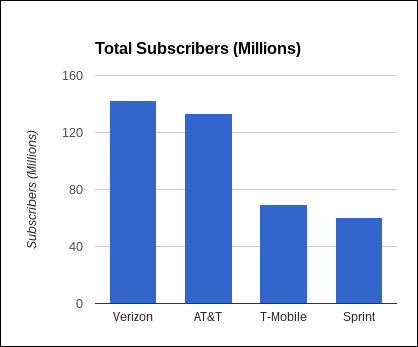 The subscriber numbers in this post are for the mobile side of AT&T and Verizon's business not the wireline and ISP side. You need to add U.S. Cellular to this, they are the 5th largest wireless carrier. Correct ... And, as T-Mobile will soon get top flight coverage, Sprint will be lonely in the second tier, and will need company to replace the magenta-colored hole T-Mobile left behind. Can you do a similar article comparing MVNOs like Republic Wireless, Ting, and RingPlus? Only publicly traded companies listed on the NYSE or NASDAQ issue quarterly reports listing subscriber numbers. Most MVNOs are not public companies and treat subscriber numbers as trade secrets. The only MVNO I know of besides TracFone that issues quarterly reports is Ting. Ting's parent company Tucows trades on NASDAQ and is scheduled to release its Q3 earnings report on Nov 7. U.S. Cellular is scheduled to report Nov 4. We will cover both on PPNews after their numbers are released. Tmobile has a lonnnnng way to catch up to att, let alone VZ.